Meredith developed an interest in fashion and apparel at a young age. In high school, she began learning apparel sewing and production in depth, and it quickly became a passion of hers. Meredith attended STEP at the Wilson College of Textiles, and was inspired to pursue more expertise in apparel production. As an undergraduate at the Wilson College of Textiles, Meredith showed designs in the THREADS 2015 Preshow. At NC State Meredith is actively involved in Sigma Kappa sorority. In her free time she enjoys spending time with friends, traveling, cooking different recipes, and practicing yoga. 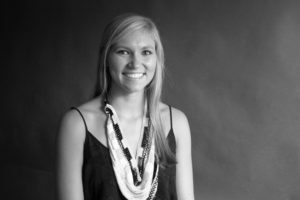 Meredith will graduate in the spring of 2017 with a degree in Fashion and Textile Management. Meredith’s collection is designed for the vibrant, contemporary woman discovering a balance between her newfound professional facets while keeping airs of her former young, rebellious nature. These confident women are fueled by their aptitude and intelligence, but do not want to lose their femininity. Meredith titled her collection Radiance with the intention that these women would make a statement and radiate when they enter the room.